"For there shall not any man among you have save it be one wife...For I, the Lord God, delight in the chastity of women. And whoredoms are an abomination before me; thus saith the Lord of Hosts." “The Lord will never permit me or any other man who stands as President of this Church to lead you astray. It is not in the programme. It is not in the mind of God. If I were to attempt that, the Lord would remove me out of my place, and so He will any other man who attempts to lead the children of men astray from the oracles of God and from their duty” (1890, D&C, p.292). “[July] 28 Sunday...President Young Preached one of the most interesting discourses ever Delivered to the people. It was a sermon of sermons. Contained much interesting doctrin, Revelation & principle. He said the Lord would not permit him nor any other man to lead this people astray. If the leaders were to do wrong the Lord would take them away. If an Apostle did not magnify his Calling the Lord would remove him & not permit him to lead the people astray. But I shall not apostatize. You need not any of you look for that for I had the promise long ago that I should not do that. Neither shall I go to hell" (Staker, Waiting for World's End, p. 262-63; journal entry for 28 July 1861). According to these statements and current LDS church beliefs, it is guaranteed that whatever the church leaders do is correct in the eyes of the Lord, because if they were doing something that was not in accord with His will, He would remove them. However, if it can be shown that LDS church leaders have led the people astray and the Lord did not remove them out of their place, then this is proved to be a false doctrine. If it can be shown that this is a false doctrine, then the souls of those who continue to believe in such a doctrine are in jeopardy of being led astray, even today. The primary doctrines Brigham Young focused on were very different than what Joseph taught openly. About 10 days before his death Joseph Smith said: "I have taught all the strong doctrines publicly, and always taught stronger doctrines in public than in private" (Nauvoo, June 6 , 1844). Brigham Young made it very clear that if the members of the church did not believe in and practice the teachings he espoused, they would be damned. If the doctrines that Brigham Young taught as being absolutely critical to exaltation were proven or shown to be not true, would he be considered a false prophet? If a church president who continued to teach and live untrue doctrines throughout his life, continued to lead the church, lived a full life, and was not removed out of his place, would the belief that the Lord would not allow the church to be lead astray also be false? If that is determined to be a false doctrine, would our souls be in spiritual jeopardy if we continued to believe that we should “follow the prophet” at all costs and do whatever he says, because we can indeed be led to do and believe things that are not of God? There is a common belief throughout the world that Joseph Smith was a polygamist, meaning he had more than one wife. This belief is held and promulgated by both the LDS Church as well as those opposed to the church and the Restoration. Could it be possible that Joseph Smith was actually not a polygamist? Polygamy is contrary to the teachings of the Book of Mormon (e.g., Jacob 2:27). Additionally, in the 1835 edition of the Doctrine & Covenants, section 101 was entitled “Marriage”, and stated the following in order to defend the church against accusations of polygamy: “we believe that one man should have one wife; and one woman, but one husband, except in the case of death, when either is at liberty to marry again”. This section remained in the LDS Doctrine & Covenants until 1876 (for more than 40 years). Interestingly, Section 132, which discusses plural wives and is contrary to the teachings of Section 101, was added at the time of section 101's removal. Section 132 includes a mixture of several revelations of questionable origin and authenticity. The transcript of section 132 in the LDS church's possession is a copy of a copy, generated by Joseph Kingsbury, a polygamist, and witnessed to by William Clayton, also a polygamist. Regardless, the only statements or teachings we have that purport to come from Joseph Smith about plural wives are found in a subset of verses in Section 132, which are often taken out of their context to imply concepts that are not included in the text. Other than that, there is no compelling evidence from Joseph to suggest that he was engaged in the kind of polygamy that Brigham Young and other church leaders and members engaged in. The testimonies and documents that are supportive of the argument that Joseph Smith taught and practiced polygamy were, for the most part, generated decades after his death and refute existing public statements made by Joseph and many contemporaries during his lifetime, which strongly disavowed the practice of polygamy. The materialization of documents decades later that purportedly “prove” Joseph’s involvement in polygamy is questionable as there was a need to demonstrate the legitimacy of this practice amid growing criticism from outside the religion. A few excerpts from LDS and RLDS church history in the following paragraphs serve to demonstrate the public rebuke and rebuttals made by Joseph, Hyrum, and others against polygamy. ​“I held the position of teacher in the original church from September, 1832, until Joseph Smith's death in 1844. It was my mission to teach and instruct from the Book of Covenants, and the Book of Mormon, and the New Testament. We went together from house to house and visited every house....It was our duty in case we found anybody with more wives than one to report them to the President of the Teachers' Quorum. That was the instruction that Brother Hyrum Smith gave in the quorum. It was about that time that John C. Bennett's secret wife system came to be heard of, and it was talked around that there was such a thing as that; and that was the reason that the instructions were given us, for [we] were told to search it out and find what there was to it if we could. That was the way it was, and so I got after him [Bennett], and followed him, and saw him go into a house that did not have a very good reputation. I followed him... And one evening I traced him and saw him go right into the house. During the time that I was a teacher from 1832 up to 1844, there was no rule or law of the original church that permitted the practice or principle of polygamy... after I reported John C. Bennett there was action taken on his case. He was cut off from the church for that offense... Joseph Smith and Hyrum Smith never taught polygamy, and there was no revelation on polygamy or celestial marriage, or anything of the kind. The church was governed entirely as a monogamy church from 1832, at the time I became connected with it, up to the time of Joseph Smith's death.” (Temple Lot Case, 190–191, 192–193). So which is it? There is no halfway ground here. Either Joseph Smith was telling the truth and engaged in a struggle with his own people, and many of the leaders he trusted, to make them stop believing, teaching, and practicing polygamy or he was lying, was a polygamist, and was a total fraud. Do you believe that Joseph Smith stood in the presence of the Father and the Son, many times? Do you believe that the Book of Mormon is true? Do you believe Joseph to be a prophet of God? Do you believe his words? Then, do you believe these (and other) of his words that he spoke against polygamy? His wife, Emma Smith, also consistently denied Joseph’s involvement in polygamy. Do you believe her testimony? Or, do you believe the words of those that came after who reported that Joseph was secretly a polygamist? Given only weak circumstantial evidence, hearsay, and affidavits generated decades later, do you think that we should give Joseph the benefit of the doubt? There is no smoking gun to pin polygamy as taught and practiced in the post-Joseph church on Joseph. On the other hand, it is clear that Brigham Young and many other church leaders and members were practicing polygamy on a large scale both before and after the deaths of Joseph and Hyrum. There are accounts of several of the twelve apostles and other church leaders and members engaging in secret polygamy rings before the martyrdom of Joseph Smith. At the time of his death, Brigham Young had 55 wives, had divorced 10 of his wives, was married to 6 women that were married to other men, and produced many children. Polygamy resulted in widespread abuse, instability of family life, destitution, and confusion, which are all contrary to the nature of God. As Brigham Young and other church leaders led the way and encouraged tens of thousands of Latter-day Saint men and women to follow them into the practice of polygamy, we must ask ourselves, was it of God? If it was, then was Joseph lying? If it was not, were the saints essentially engaged in unlawful marriages akin to adultery, possibly forfeiting their exaltations? 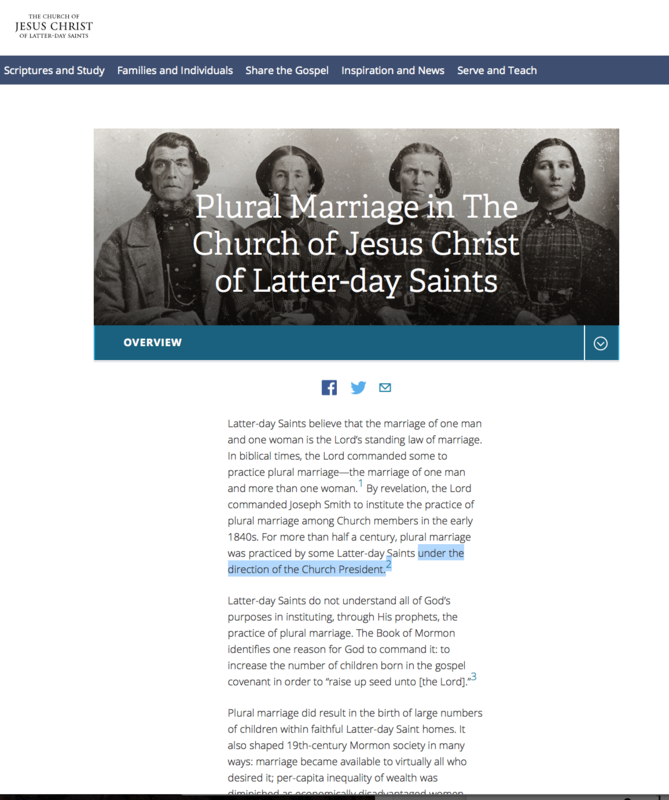 Even the LDS church’s webpage on plural marriage admits the role of the leaders: “For more than half a century, plural marriage was practiced by some Latter-day Saints under the direction of the Church President.” That is an accurate statement as it does not say “under the direction of the Lord” or “following the revelations of Joseph Smith;" it was encouraged and condoned by the direction of the Church President. Was Brigham Young innocently continuing what he had learned from Joseph, who denied and was trying to discreetly stop the spread of polygamy in Nauvoo prior to his death? Or, was Brigham Young practicing his own version of what Joseph was trying to teach in terms of the family of God and adoption, corrupted by the teachings of spiritual wifery that had been imported by several recent converts? Were many of the doctrines set forward by Joseph Smith altered or corrupted by Brigham Young? Could the teachings of Brigham Young lead people astray, perhaps into significant sin? If so, did the Lord remove Brigham from his place? Has Joseph Smith been made the scapegoat for the false teachings and practices promulgated by Brigham Young? If this supposed pinnacle doctrine and teaching of polygamy was not from Joseph, has LDS church history narrative been whitewashed so that people will believe that there has been a continual flow and building of doctrine, revelation, and priesthood since Joseph Smith? Has the character of Joseph Smith been maligned to protect the reputations of men who have fallen into error or a wayward institution? Does your conscience allow you to sit idly by and allow such falsehoods be perpetuated? If the president of the church did indeed lead the people astray then all arguments about whether keys were transferred and by whom after Joseph’s death are moot because, even if President Young had received “all the keys” from Joseph and/or Hyrum, how he lived his life thereafter would determine if he held the keys or lost them. For if we believe that “keys” can be held and passed along regardless of the way in which a key holder lives their life, then the LDS church is of the same cloth as the priesthood of the Catholic church, which claims their keys have been handed down since the time of Christ all the way to the Pope today. Yet the LDS church believes that a “Great Apostasy” occurred sometime following the establishment of “the Church of Christ” for three primary reasons: 1) the original leaders died or were killed without an opportunity to pass along their keys, 2) the leaders became wicked, and 3) the ordinances were sufficiently altered so as to be rendered null and void by God. From lds.org: “men corrupted the principles of the gospel and made unauthorized changes in Church organization and priesthood ordinances.” If any of these things happened following the death of Joseph Smith, would the fate of the LDS church be any different and would any keys that persisted been rendered null and void? However, since the LDS church believes in an unbroken line of authority, the hand of God must be twisted to fit within a narrative and pattern of history that He very well may have had very little to do with. The existing evidence of Joseph’s polygamy, primarily based on self-report statements that were generated decades after the deaths of Joseph and Hyrum, would not stand up in court today. If your testimony of the LDS church is based primarily on the belief that the leaders cannot lead you astray, it is time to reexamine that belief and make sure that it is of God, as well as to determine whether all your beliefs built from your trust in church leaders, including polygamy, are of God. Additionally, there are many who have suspended or abandoned their belief in God or that Joseph Smith was a prophet because of the troubling things that they have been told about Joseph Smith and polygamy. If what has been taught is a deliberate fabrication or a result of faulty memory, is it time to reconsider the spiritual experiences you have had in your life, and determine whether God truly exists and if Joseph Smith was telling the truth?